I heard two quick heavy thuds and wondered what the cats were up to now. Jean-Luc strolled into the room with a "what's that?" look on his face. Not a cat induced noise. Phoof! Thunder? I hoped not, because I didn't want any power glitches on my second attempt to download 1.8 gigabytes of North American maps to my TomTom GPS, which was underway. The first attempt had exhausted my download allowance for August, so I've radically upped my capacity and doubled the speed of my Internet connection in preparation for this redo. I'd even turned off "sleep" so the computer wouldn't snooze off during the project. After some other fiddling around, the download was underway and the estimated progress said 20:15 remaining when I decided I could go to the post office. I'm not at all sure whether that meant 20 hours or 20 minutes. It was all gloom and thunder out there, dry lightening with just speckles of rain, never really wetting the ground. I won't mention the big fear, the eff-word, and I don't mean the one that ends in "ck." When I got back home in half an hour, to all appearances the big download had finished successfully. Until I closed a couple of windows and was left with an error message, "The connection to the TomTom server timed out." On the plus side, with higher speed, the update got halfway through in one hour, rather than the 3½ hours it took to fail on the previous try. Could this be called a semi-triumph? Sister managed to extract the photo of the dangerous turkey from her phone and put it on her blog today and I ruthlessly snagged it for here. This turkey has a reputation. My friend Betty is a petite lady who has a petite dog she used to walk in the neighborhood. No more. She told us about others . . . 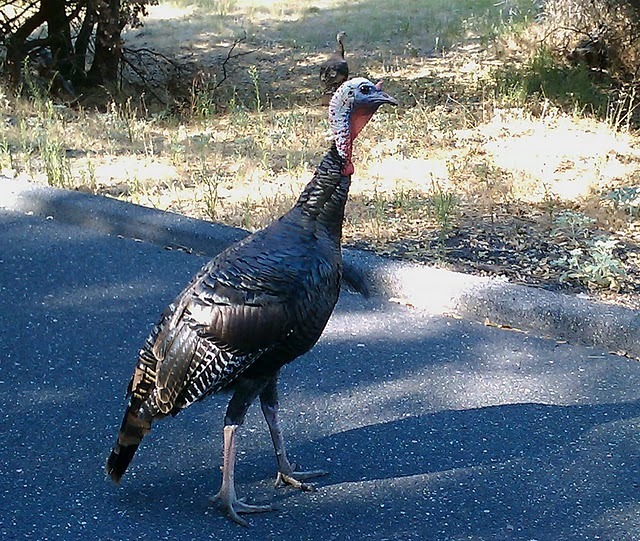 Sister and I were driving up a street near her house the other day when we saw the turkey standing in the road. It didn't budge as we drove on by. I had to drive around him. Too bad we don't have a camera. I have my phone camera. Should we go back? We might never see him again. I swung the car around, drove back past the turkey, did another U-turn at the corner. I drove up beside the turkey and Sister took his picture. (We refer to it as "he," although we suspect it's more likely to be a "she," guarding her giant offspring.) Not close enough. I moved the car forward a little and Sister reached out the window for the next shot and the heretofore immobile bird lurched toward her so I hit the gas. I could see the turkey, chasing us up the hill, in the rear view mirror. We subsequently talked to one of Sisters neighbors who had been bitten by the turkey. It's funny, but also rather scary. I had a rough start to Thursday morning. I put a cup of coffee in the microwave and forgot about it until a few minutes before I had to leave for water aerobics. And that's not a good time to drink coffee. Between no coffee and the sleep-inducing exercise, I was afraid I'd doze my way through NeedleCrafts. We had ten participants at NeedleCrafts again, not counting Terri's bird, Jeffrey, who took a turn on each person's finger. I completely forgot to take out my camera. I did take a photo of this colorful array of yarn. Rose was looking for some bright multicolored yarns to make yoga sox for the granddaughters. Judy has an endless supply. I only managed to open the mail that I'd taken from my PO box on Wednesday. I had a bit of time available before the computer club board meeting, so went to Sister and Brother-in-Law's to get a quick shot of the Big Pour, a major foundation part for the grand garage. So this morning I skipped water aerobics, opting instead for a nice warm shower, shampoo and soap down, to get rid of the lingering odor of chlorine that doesn't seem to wash off in the shower at the pool. And nicely put Ora-Gel instead of antibiotic ointment on a sore on my knee. I couldn't tell if it numbed my knee like it does my toothache. Is it just me or is there something wrong with the world when your turkey is biting and my grizzly is stuffed? LOL! How Can I Blog . . .
"But they don't like us . . . "
Maybe it's the lazy days of summer . . .